Bosch StarlockPlus® Oscillating Multi-Tool Accessories provide heavy-duty performance in demanding professional applications. This blade features a laser-melted carbide grit with a unique straight/curved Dual-Tec design. 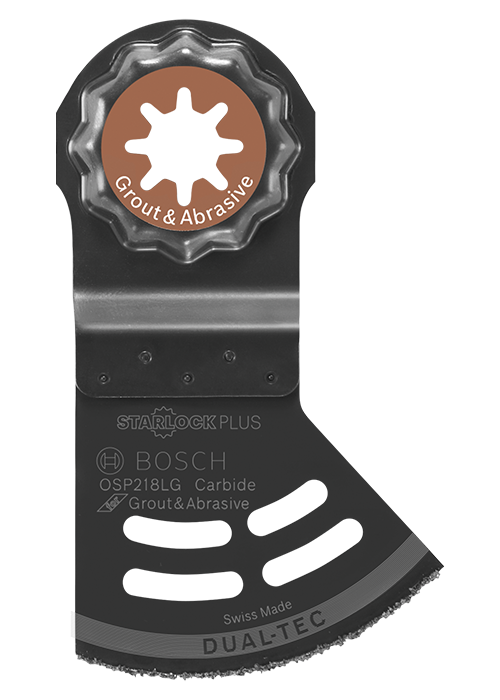 It provides the best performance of both plunge and segmented blades, for grout removal applications and cuts in abrasive materials such as fiberglass. It features vibration-reduction slots for increased precision. Starlock® accessories deliver a three-dimensional blade grip to deliver higher torque transfer, reduced vibration and professional performance. They feature a three-second no-touch quick change interface with Starlock® multi-tools. StarlockPlus® accessories are engineered to be compatible exclusively with StarlockPlus® and StarlockMax® multi-tools due to the power requirements required to drive the blades. Color-coded interface and laser-etched blade designed to allow user to quickly identify the right blade. Professional-grade Swiss-made blade manufactured with premium materials and innovative engineering.